It’s reproduced here by their kind permission. Diana Burns investigates clues in a search for the occupant of an ornate but unmarked grave in the City of the Dead. To the Victorian mindset, death was an ever present fact of life and part of the fabric of existence, to be accepted if possible and whose power was to be somehow neutralised. In Glasgow alone, infant mortality peaked in 1871 at 191 young deaths for every thousand born, while a demise at the birth, on the part of the mother, the baby or both, was commonplace. Even minor illnesses and mishaps could prove fatal, yet our forebears were more comfortable with the Grim Reaper and even went about funerary arrangements with some style and flamboyance. This dark energy still survives in the fine architecture of our magnificent 19th century cemeteries; and, driving on the west-bound M8 in Glasgow, you can still catch a passing glimpse of these defiant retorts to inevitable mortality. Look for a moment over to your left near junction 15 and of 50,000 souls laid there between 1832 and 1960. Only around 3,500 of the occupants, mostly the rich and famous, have individual memorials to commemorate their passing, whereas the poor and less deserving are all buried in unmarked graves. 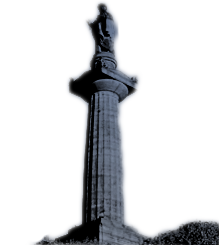 At the top of the hill stands a statue of Protestant firebrand John Knox, erected by public subscription in 1825; and owning a burial plot close to his stern monument was confirmation that the deceased were among the elite of local society. A few metres away from this statue stands a tall, sandstone obelisk on whose south-facing base is a carving of four little children, gazing at an oval memorial inscribed simply with the two telling words ëBeloved Mother’. One of them, older than the rest, has her arm around a child in petticoats and has a baby on her knee. The fourth child leans on this older girl’s shoulder. The name of the grave’s occupant is unrecorded on the stone and the only other carving is the name of the sculptor, one G. Mossman. This turned out to be George Mossman, who lived from 1823 to 1863 and belonged to a family business of monumental sculptors, many of whose works appear in burial grounds. This particular obelisk is actually listed in his collected works as ëDearest Mother’; and I first saw it on a guided tour and became intrigued as to the identity of the unknown mother who had died. Her memorial stands in a prestigious position where the families of prosperous merchants, ship owners and shipbuilders all lie buried which suggested that the mother in question, whether dearest or beloved, must have been a woman of some substance. The monument has been dated to around 1851 and, since headstones were not normally erected until at least a year after the interment, I searched through burial records for the period in question and a dozen likely candidates soon emerged. These records in the Mitchell Library made interesting reading, reflecting a more uncertain world than ours where death could visit at any time in often bizarre circumstances which included falling chimneys, collapsing walls, exploding boilers and even a kick from a horse. One eleven-year-boy was apparently choked by a mouthful of butcher’s meat, though most of the causes of death entered in the registers are terse and commonplace – smallpox, whooping cough, debility, pneumonia and so on. Sadly, during my research, I uncovered one case where three brief, cold entries recorded the poignant tragedy of Peter Dunn who, over the space of just one week, lost his wife and both newly born twin daughters. I returned to the Necropolis where a stroll round the head-stones left only five women unaccounted for; and finally, with the invaluable help of someone who, with her husband, has taken on the daunting chore of recording all the epitaphs, I was able to find with almost total certainty the identity I sought. 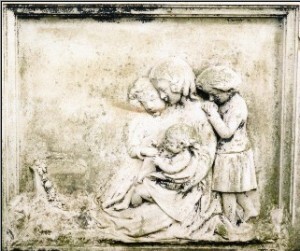 Agnes Strang, the wife of Allan Gilmour, died in childbirth during the winter of 1849 and was interred in December, aged 33, leaving behind three young children, plus the new baby. On closer inspection, two of the children depicted on the stone did indeed turn out to be small boys dressed in petticoats after the fashion of the time and only really distinguishable from their older sister by their slightly shorter, bobbed hair. Their father was a wealthy ship owner and merchant, born in the Renfrewshire Mearns. He was eleven years older than his wife and descended from the Polloks, wealthy landowners on the south side of the city. One branch of the family had established a thriving business at New Brunswick in Canada, going on to acquire extensive stretches of forest upcountry where timber must have seemed limitless. This company also opened up a chain of sawmills which processed the trees knocked down by lumberjacks for use in ship-building. At the age of 16, Allan was sent across the North Atlantic on one of his family’s ships to join this rapidly expanding business and was soon promoted through the ranks, eventually becoming a partner. After his wife’s untimely death, he and his offspring continued to live in the comfortable family home in St Vincent Street, together with the childrens’ grandmother, a cook, a housemaid and two nurses. Allan eventually retired to the plusher Park Gardens overlooking the West End where he died in November, 1884, being buried alongside Agnes. He never remarried and left a huge estate, valued in today’s terms at £24 million. I am glad I was able to put a name to “Dearest Mother”: but there are so many people lying up there on the hill whose identities are being slowly but inexorably lost to the ivy, erosion and the windswept scars of neglect. An organisation called, suitably enough, “The Friends of the Necropolis” has now belatedly been set up to champion its cause; and to restore a sense of pride in this historic asset. Their website can be found at www.glasgownecropolis.org.